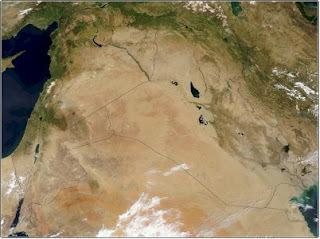 One can tell just from looking at a satellite image of Mesopotamia that it is mostly desert. A climate map tells us that most of the region is considered arid or semi-arid, just what we would expect. 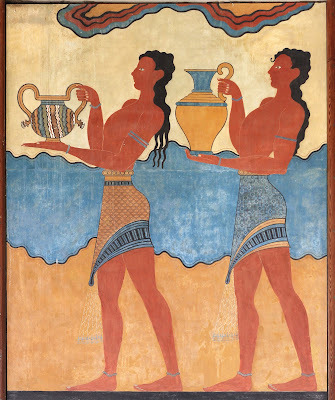 One way to look at Mesopotamia’s climate is to examine different factors that affect climate. Generally, the higher a place’s latitude, the lower its average temperature will be. Mesopotamia is at a mid-range latitude. It is roughly between 30 degrees and 40 degrees north. So, like most mid-latitude places, Mesopotamia has distinct seasons with very warm summers and cool to cold winters. In the summer months (June to September, because it has a northern latitude) the temperature can get well over 100 degrees Fahrenheit. In the winter, temperatures can drop into the 30s or lower, depending on the next factor – elevation. Almost always, temperatures will decrease as elevation (the distance above sea level) increases. So in northern Mesopotamia as you go up into the foothills and into the Zagros Mountains and other high elevations, the average temperature will be cooler. Also, the mountains surrounding Mesopotamia to the north tend to create a rain shadow. That is, the rain falls on the mountains leaving the air much drier over the plains below. This is a big reason why much of Mesopotamia is in the desert. Mesopotamia is partially on the coast of the Persian Gulf, but otherwise it is quite a distance from major bodies of water such as the Mediterranean, the Caspian Sea, and the Red Sea. In the areas near the Persian Gulf, the climate is a little more moderate. This means basically that the temperatures have less of a range between the highs and lows. You might think that these areas (modern-day Kuwait City, Kuwait for example) would get more rainfall than areas in Central Mesopotamia (modern Baghdad), but it’s not the case. This is mainly due to the fact that the prevailing winds usually blow from the desert to the sea in this case. So, to summarize, Mesopotamia is a large region with a climate that varies based on elevation and proximity to the sea. However, it is generally very dry (less than 5 inches of rain per year in Baghdad, on average), and has distinct seasons. In the lower elevations, summers are very hot and the winters are mild to cold. In the higher elevations, rainfall is a bit higher (9 inches or so in some places) and the average temperatures are a bit lower.